In recognition of completing the fifth year of its On Our Way to Ending Hunger program, Hormel Foods Corporation (NYSE: HRL) today announced that donations to hunger relief organizations totaled more than $5.2 million during fiscal year 2015. • Hormel Foods donated $400,000 to local hunger relief organizations in 40 communities where it has manufacturing facilities. Each plant identified the organization(s) within its community to support. For example, the company’s Fremont (Neb.) Plant donated $10,000 to the Hope Center for Kids for its summer lunch program, and the company’s Beloit (Wis.) Plant donated $5,000 to the Beloit Salvation Army and $5,000 to Caritas of Beloit. • Hormel Foods continued to help those in need during disaster situations, and donated more than 20,000 cans of Hormel® Black Label®canned luncheon meat to help those affected by Typhoon Soudelor. In addition, Hormel Foods donated one semi-trailer of Austin Market™ canned luncheon loaf and one semi-trailer load of Hormel® Compleats® microwave meals to help those affected by flooding in South Carolina. • To help address childhood malnutrition in Guatemala, Hormel Foods donated 2.4 million cans of SPAMMY®, a shelf-stable poultry product that is fortified with vitamins and minerals. Hormel Foods employees also participated in trips to Guatemala, engaging firsthand in Project SPAMMY®. Additional information about the company’s fiscal 2015 philanthropic efforts will be available in the Hormel Foods 2015 Corporate Responsibility Report, which will be released in June. Hormel Foods Corporation, based in Austin, Minn., is a multinational manufacturer and marketer of consumer-branded food and meat products, many of which are among the best known and trusted in the food industry. 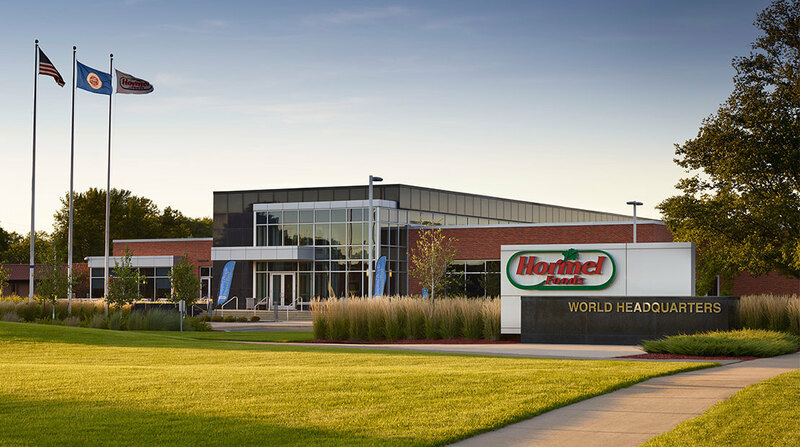 Hormel Foods, which leverages its extensive expertise, innovation and high competencies in pork and turkey processing and marketing to bring branded, value-added products to the global marketplace, will celebrate its 125th anniversary in 2016. The company is a member of the Standard & Poor’s (S&P) 500 Index, S&P 500 Dividend Aristocrats, and was named one of “The 100 Best Corporate Citizens” by Corporate Responsibility Magazine for the seventh year in a row. Hormel Foods also received a perfect score on the 2016 Human Rights Campaign Corporate Equality Index, was recognized on the 2016 Best for Vets Employers List by Military Times, and was named one of the 2016 Best Companies for Leaders by Chief Executive magazine. The company enjoys a strong reputation among consumers, retail grocers, foodservice and industrial customers for products highly regarded for quality, taste, nutrition, convenience and value. For more information, visit https://www.hormelfoods.com and http://2014csr.hormelfoods.com/.